This Caran d'Ache Desktop Crank Pencil Sharpener will sharpen any round, hexagonal or triangular pencils from 4-8mm in diameter. It is not suitable for larger-diameter pencils. This is a helical crank sharpener. To sharpen your pencil, you need to pinch the handles on the top of the chuck, pull the chuck away from the main body of the sharpener, and insert your pencil as far as possible before releasing the handles. The chuck will then grip the pencil and hold the tip against the sharpening mechanism. 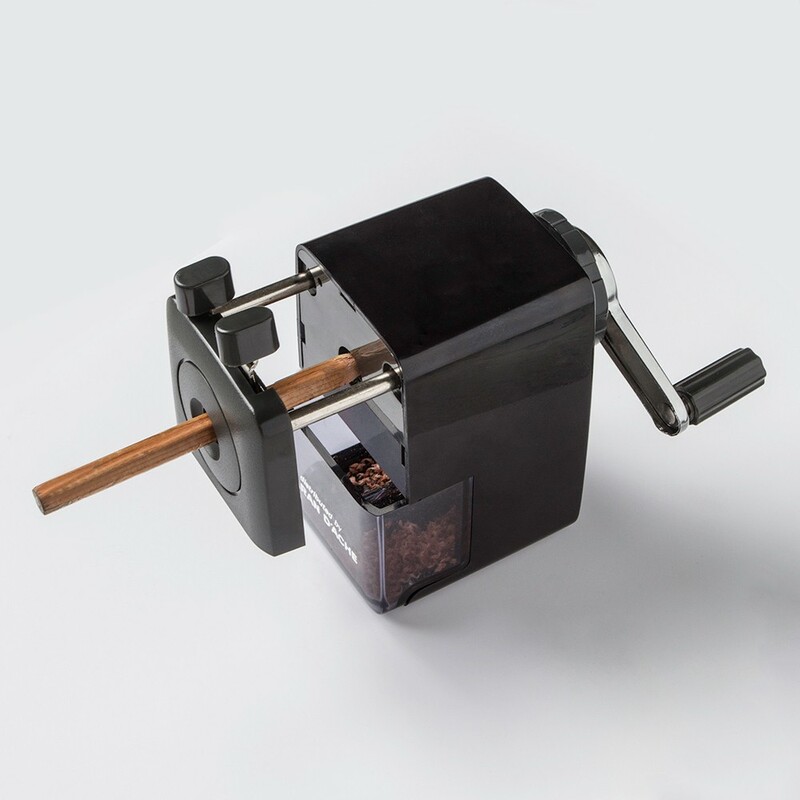 As you turn the handle on the back of the sharpener, the sharpening cylinder will revolve around the pencil, shaving away the wood and sharpening the lead to a fine point. Once the pencil is sharp, you will be able to turn the handle without resistance. At this point, release the chuck again and take out your sharpened pencil. It will be necessary to empty the shaving container from time to time. 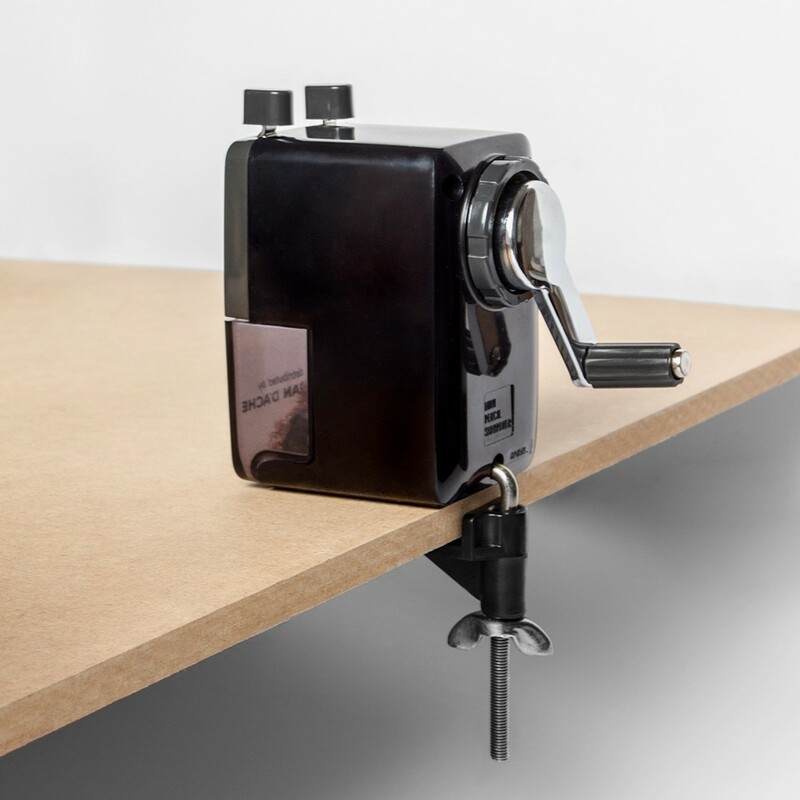 This sharpener includes a clamp which can be used to attach it to your worksurface, though it will not fit tabletops of over 4.2cm. This sharpener measures 11 x 11 x 5.7 cm. The sharpening mechanism is made from metal, and the casing from black plastic. The shaving container is made from transparent plastic.